On May 17, after having travelled thousands of miles from home, India began their quest for Olympic glory when it played Austria. It was an easy game for India, and they won 6-0. Dhyan Chand scored 4 of those goals, showing that he was in top form. Against Belgium the next day, India won 9-0. India next played Denmark on the 20th, and won 5-0. India was through to the semis. he Amsterdam Games were the first Olympics in which women athletes would take part in the track and field events. A new stadium that could hold around 40,000 spectators welcomed the 3000 odd competitors. On May 17, after having travelled thousands of miles from home, India began their quest for Olympic gold and glory when it played against Austria. The weather was fine, and the Indian team was confident and determined. It was an easy game for India, and they won 6-0. Dhyan Chand scored 4 of those goals, showing that he was in top form. Against Belgium the next day, the Indian team made some changes and won easily 9-0. India next played Denmark on the 20th, and the Danish goalkeeper created many problems for Dhyan Chand and stopped certain goals. India still won 5-0 and were through to the semi-finals. On May 22, India beat Switzerland 6-0 in the semi-final. Thus India qualified for the Olympic hockey final, where it would clash against hosts Holland for the gold. 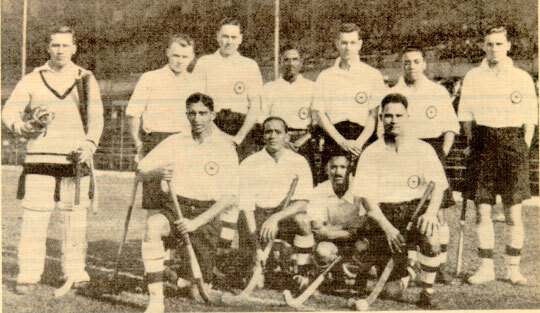 In the trial matches prior to the Olympics, India had beaten the Dutch Olympic XI 8-1. This helped them get familiar with their Dutch counterparts, and India was confident of beating them again. However, Holland had the advantage of their home crowd support.